Wesley Nagy said he is applying for a state permit to grow and sell recreational marijuana in West Tisbury. As a medical marijuana dispensary nears reality in West Tisbury, a request for approval of retail marijuana sales could be in the offing. Wesley Nagy told the town selectmen Wednesday that he has begun the permitting process to cultivate and sell recreational marijuana on his property at 24 Cournoyer Road. Mr. Nagy approached selectmen requesting a letter of non-opposition from the town. 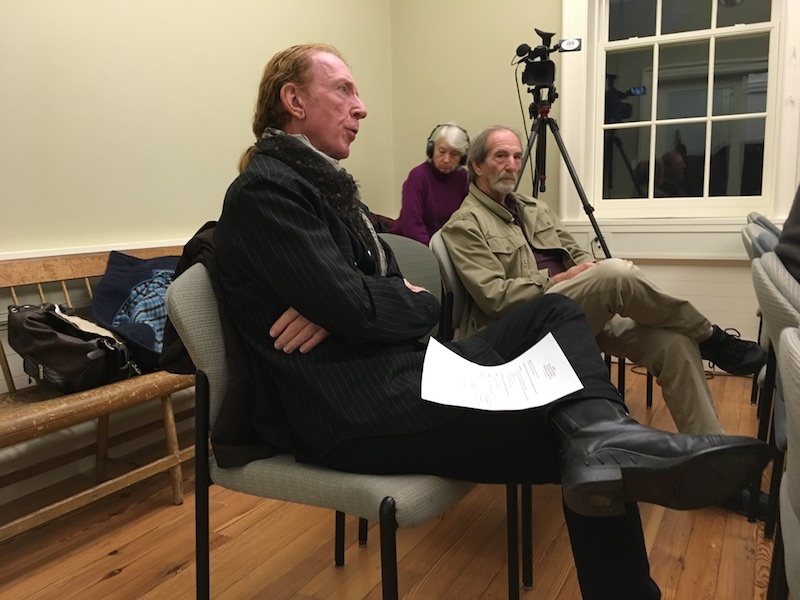 Island businessman Geoff Rose, who expects to open a medical cannabis dispensary on State Road in West Tisbury next year, also attended the meeting. Mr. Nagy said he is just beginning the process of applying for a recreational sales and cultivation permit from the state Cannabis Control Commission. He said one of the prerequisites is a letter of non-opposition for the license. “It’s just one of the technicalities before they’ll even accept the application for the license,” he said. According to state guidelines, applicants seeking licensure as a marijuana establishment must provide a host community agreement outlining the terms of their operation in the town. They must also hold a community outreach meeting to get public input. Mr. Nagy said he owns the property in question, which is currently home to the Environmental Health Center of Martha’s Vineyard, situated in a small commercial complex across the road from Conroy’s Apothecary and near the Martha’s Vineyard Public Charter School. Selectman and board chairman Cynthia Mitchell said she wanted to hold off on any decision until the town zoning board of appeals had granted the approval, noting that was the process the board followed when Mr. Rose first approached them. “When Geoff [Rose] was going through the process and came to us, he had not yet completed the zoning board of appeals special permit process, and we delayed the letter of non-opposition until that had been completed,” Ms. Mitchell said. She said she wanted to ensure that there was no contradiction within the town. “Locally the process we’ve followed in the past is in order to be sure that the town is not opposed to it, the zoning board of appeals has to allow it,” Mrs. Mitchell said. Selectman Jeffrey (Skipper) Manter 3rd said when the issue does come before the selectmen, he will not support it, citing a difference between medical and recreational cannabis. Mr. Manter said the town is an abutter to the property, and the conversation would have to be ongoing. “Let’s wait for the hearing,” he said. In other business, selectmen approved an increase in funding for the Martha’s Vineyard Cultural Council from $3,000 to $3,500 for next year. Board members volunteered to write a letter encouraging other towns to increase their contributions as well. At the request of the Agricultural Society, selectmen voted to post no parking signs along Panhandle Road. A preliminary list of draft warrant articles for the April annual town meeting included the purchase of a Nissan Rogue for town business, $50,000 for facilities projects and maintenance of headstones at the town cemetery. Due to a scheduling conflict, selectmen agreed to meet on Thursdays rather than Wednesdays for eight weeks beginning March 7. The town holiday party will take place Dec. 14 from 5 p.m. to 7 p.m. at the Agricultural Hall. Everyone is asked to bring a dish for six to share.